The CoffeeShop Blog: CoffeeShop "Enchantment B&W" Photoshop/PSE Action! CoffeeShop "Enchantment B&W" Photoshop/PSE Action! 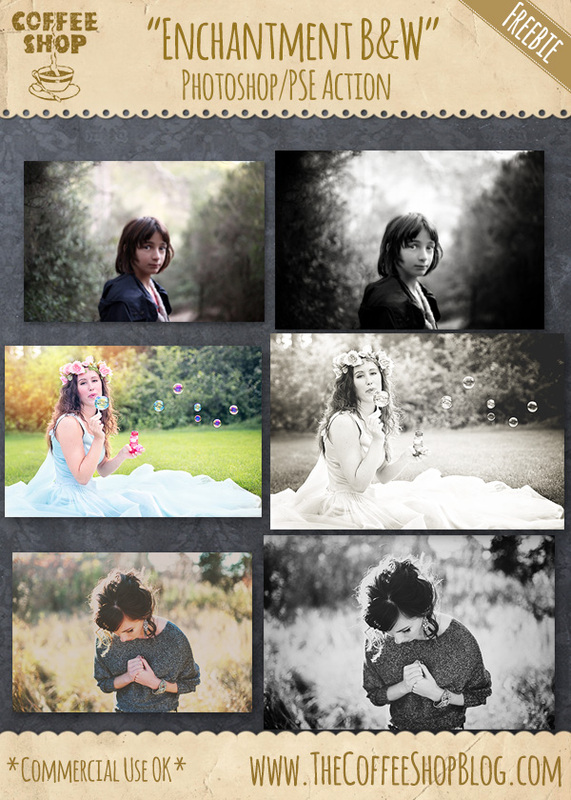 Today I have a brand new action I called "Enchantment B&W". This is the third in a series of "Enchantment" actions (Golden Enchantment, Enchantment) and I have had so much fun designing them all. 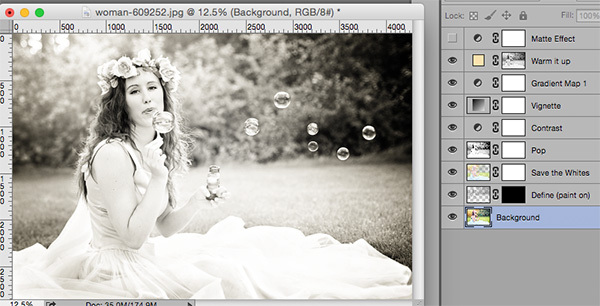 "Enchantment B&W" is a very stunning B&W conversion action and is completely adjustable. 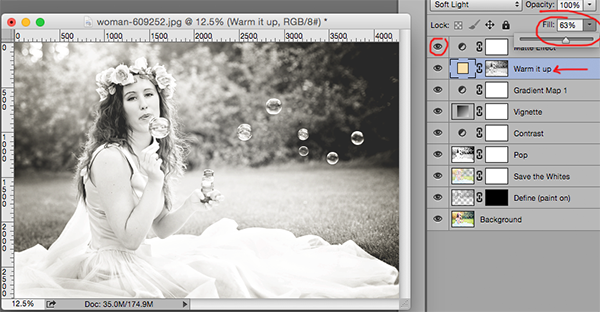 I think you will really enjoy using this on your images when you need a really nice B&W conversion method. The original image from the last before/after on my ad above can be found here. In this example I used a beautiful image from Jill Wellington (Etsy Shop, Facebook, Blog, YouTube Videos, Pixabay). This is what the image looked like after running the action, no adjustments. I turned on the "Matte Effect" layer and brought "Warm it up" down to 63%, but made no other adjustments. In this gorgeous portrait I lowered "Warm it up" to 29%, used a soft black low opacity brush and removed some of "Contrast" off her face and used a 100% soft white brush to add the "Define" layer to her eyes and hair. 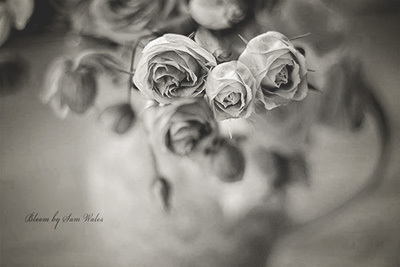 This original image from Sam of Bloom was stunning, but I also like this B&W version as it has so much texture. Sam does sell her work, you should really go check out her Facebook page! 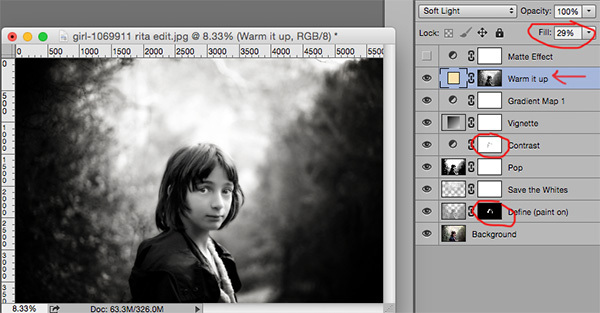 You can also take a very vibrant color image (see the original here) and reduce the color using "Enchantment B&W". In this edit I turned on the "Matte Effect" and dialed the "Gradient Map 1" B&W conversion layer down to 63% fill to add some of the color back into the image. Then I used a soft 100% soft brush to remove some of the "Vignette" brightness from the center of the image. Have fun playing with my newest action!!! I would love to see your own edits on my Facebook page. Download the CoffeeShop "Enchantment B&W" action. You can also download it here. I've been using this action for years now and LOVE it! My favorite ever. However, the last couple of weeks when I've tried to run it (Photoshop CC v. 20.0.1), it tells me "The command Convert Mode is not currently available." Is it possible that a recent update caused it to not be compatible? Any ideas on a fix? Thanks so much for sharing your beautiful actions!! Just reset your Photoshop preferences, it will fix it!